Driving into work the other morning, I was surprised to see someone stacking hay with a New Holland Stacker. Not too many farmers still put up the small bales, opting for the one-ton or round bales. Seeing that stacker and the bales took me right back to the summers of my childhood. My dad grew hay and wheat and corn on our farm. When it was haying season (which happened three to four times every summer) even I got called upon to help. When I was little my “help” was riding along with dad on either the swather or the baler while he worked. A few times I was allowed to ride in the stacker, sitting on a little tool box between the seat and the control box on the opposite side of the door. My mother had an overwhelming fear that I would fall out of the stacker and be pulverized before my dad knew what had happened. Her fear was not without some merit. According to family lore, my dad, brother and a neighbor drove to California to get the hay stacker back when I was too young to remember. They bought it and drove it home on the freeway. 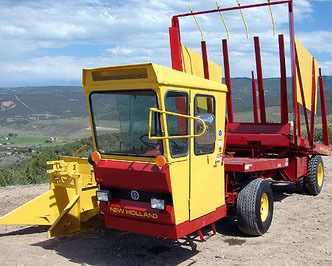 Unlike most of the farm equipment that never goes terribly fast, the stacker was capable of speeding right on down the road. When my brother Kim operated it, speed was definitely used. As he drove from the field to the stack yard, dust would fog behind him like a tan other-wordly vortex. My dad didn’t drive it quite so fast, but he still managed to make the dust fly. I think it was the summer I was 15, my dad decided we could get the hay stacked a whole lot faster if I rode along with him on stacker and jumped off to turn up the bales that weren’t sitting upright. Sometimes when the bales come out of the baler, they would roll to their side and the stacker can’t pick them up that way. It was my job to go along each windrow and make sure every bale was straight and lined up, ready for the stacker. I usually did this by riding my little Honda 110 up and down the rows, turning over the bales that were flat and having a great time. On this particular day, though, my dad decided I should keep him company in the stacker. So as he drove through the field picking up bales, I sat on the edge of the open door, watching for flat bales. When I saw one, I’d jump out, run over, turn it upright and then run and jump back into the stacker. This worked great until Dad hit a badger hole and I fell out. Envisioning my meager little world coming to an end under one of the huge tires, I was completely surprised when Dad managed to barely avoid hitting me. That’s one secret we’ve kept all these years. Oh that made me laugh and laugh and laugh girl. I can just hear your dad saying that too….Thanks for the giggle today! That’s what I’m here for! Glad you enjoyed it Michele!